Sweet, organic cauliflower sticks with a very rich texture. Try cauliflower in a way you may never have before. Frozen individually, making it easier for you to grab the portion that you desire. While many popular diets advise against white-colored food items which tend to be over-processed, such as pasta, rice, bread and sugar, cauliflower is a non-starchy cruciferous vegetable, like cabbage and broccoli. Cauliflower provides beneficial antioxidants and phytonutrients as well. It also contains fiber to enhance weight loss and digestion and choline that is essential for learning and memory. It’s also a great source of vitamins C and K, and minerals such as potassium, manganese, magnesium, phosphorus, calcium, and iron. 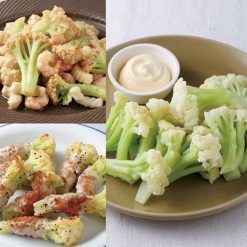 These new cauliflower sticks come in an easy-to-eat precut shape, that even if you don’t like cauliflower very much, this delicious vegetable option should get you to hit your daily fiber requirement. You can now also save time while cooking because these cauliflower sticks are already cut and washed. These cauliflower sticks can be used in a wide variety of cooking, in salads and other dishes. Cauliflower has become a household health food recently, where the white crown has become a worthy ingredient substitute for those with dietary restrictions. 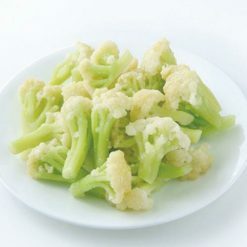 This cauliflower can be added to an assortment of dishes, to be used as a salad garnish, sautéed in butter, steamed, or stir-fried with Chinese food. Our suggestions include cauliflower scramble (use cauliflower instead of eggs), baked buffalo cauliflower (instead of chicken), cauliflower tacos (instead of ground meat), and cauliflower pizza crust (instead of wheat). Like broccoli, cauliflower provides a high amount of protein for the number of calories it delivers. Please remove the amount of cauliflower you need, still frozen. Quickly boil the cauliflower in a pot of boiling water. Empty the contents of the pot into a strainer and removing all excess water. This product contains organic cauliflower sticks (packaged and processed in China).